Faith in the New Millennium The Future of Religion and American Politics | Free eBooks Download - EBOOKEE! Matthew Avery Sutton, Darren Dochuk, "Faith in the New Millennium: The Future of Religion and American Politics"
The Statue of Liberty-depicted on a roadside billboard-did not carry her customary torch and tablet. Instead, she shielded her eyes from words that towered beside her, words that highway drivers could not possibly avoid: "We are no longer a Christian nation." Underneath was the name of the man who spoke them, the nation's president, Barack Obama. He had made the original statement-"Whatever we once were, we are no longer a Christian nation, at least not just"-four years earlier. Since then those words had appeared, in one form or another, not just on billboards but in a host of other venues, a visible symbol of America's divide over religion and politics. 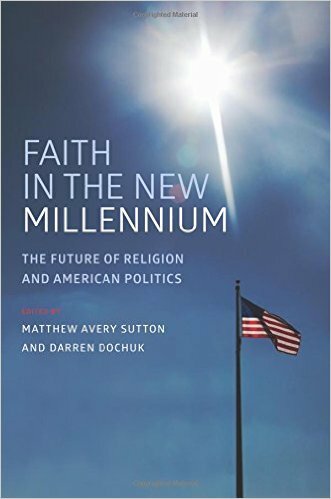 In Faith in the New Millennium, a group of leading historians explores the shifting role of religion in American politics in the age of Obama, shedding new and fascinating light on the interplay of faith and politics. Each of the sixteen contributors examines a contemporary issue, controversy, or policy through a historical lens. In an age of the 24-hour-news-cycle, where complexity is often buried under bluster, these essays make a powerful case for understanding the stories behind the news. They tackle such topics as immigration reform, racial turmoil, drone wars, foreign policy, and the unstoppable rise of social media. Taken together, they reveal how faith is shaping modern America, and how modern America is shaping faith. No comments for "Faith in the New Millennium The Future of Religion and American Politics".